The Hagglund Bandvagn 206 (BV 206) is a tracked articulated, all-terrain vehicle developed by Hagglund for the Swedish Army. It’s the ultimate personnel or equipment carrier! It consists of two units, with all four powered tracks. 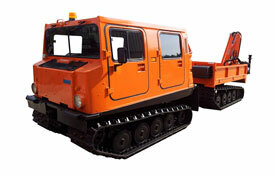 Our decommissioned units are rented as transports for people and equipment for access to hard to reach locations. Hagglunds can carry personnel, up to 17 people (6 in the front compartment, 11 in the rear) and the trailer unit can be adapted for different equipment hauling applications. Dimensions L: 270.28" H: 94.56" W: 72.89"
After fifteen years of beating the bush and floating through half the rivers in the north, we've learned that as great as our equipment is - sometimes clients need to have seasoned operators to accompany the machines. Most important is their need for qualified, professional and competent operators who can take the burden of care and maintenance while they focus on the job at hand.